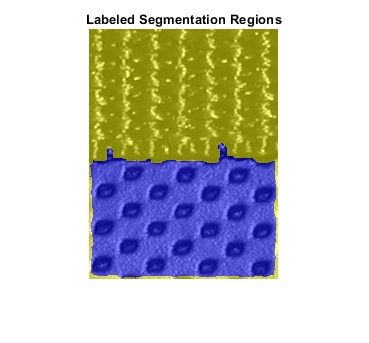 This example shows how to use texture segmentation to identify regions based on their texture. 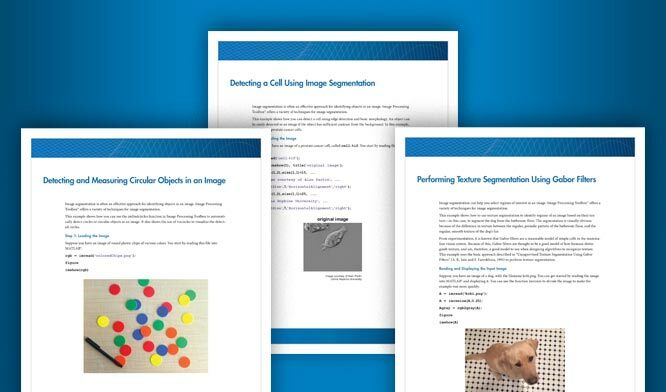 Your goal is to segment two kinds of fabric in an image using texture filters. 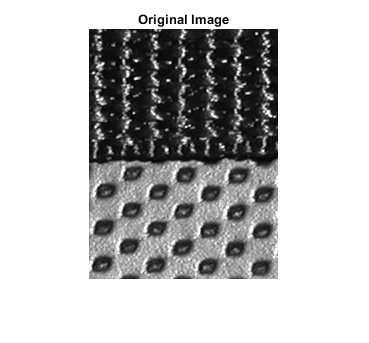 Use entropyfilt to create a texture image. The function entropyfilt returns an array where each output pixel contains the entropy value of the 9-by-9 neighborhood around the corresponding pixel in the input image I. Entropy is a statistical measure of randomness. Use rescale to rescale the texture image E so that its values are in the default range for a double image. 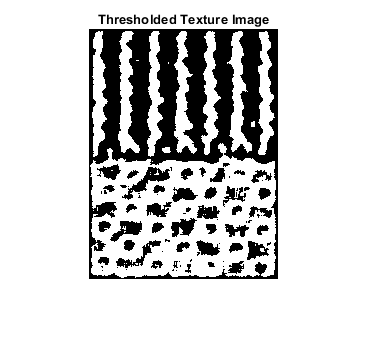 Threshold the rescaled image Eim to segment the textures. A threshold value of 0.8 is selected because it is roughly the intensity value of pixels along the boundary between the textures. The segmented objects in the binary image BW1 are white. 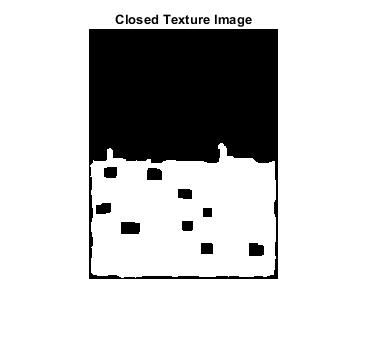 If you compare BW1 to I, you notice the top texture is overly segmented (multiple white objects) and the bottom texture is segmented almost in its entirety. You can extract the bottom texture using bwareaopen. Use imclose to smooth the edges and to close any open holes in the object in BWao. A 9-by-9 neighborhood is selected because this neighborhood was also used by entropyfilt. Use imfill to fill holes in the object in closeBWao. Compare the binary image roughMask to the original image I. 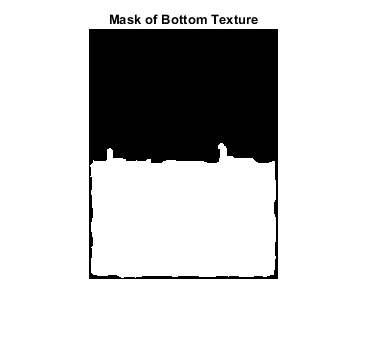 Notice the mask for the bottom texture is not perfect because the mask does not extend to the bottom of the image. However, you can use roughMask to segment the top texture. 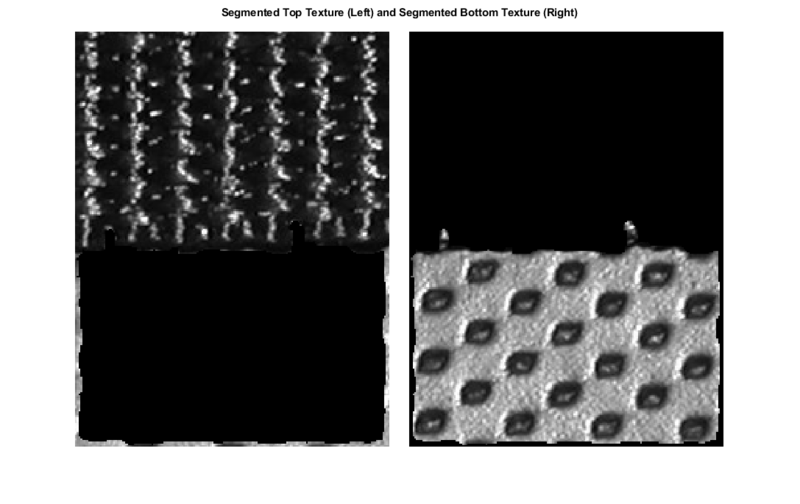 Get raw image of the top texture using roughMask. 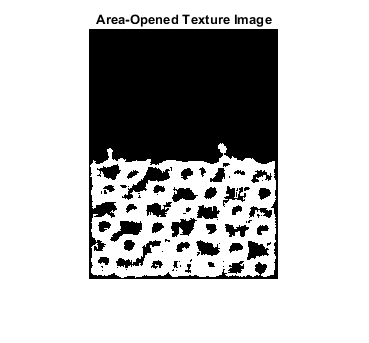 Use entropyfilt to calculate the texture image. Threshold E2im using a global threshold. If you compare BW2 to I, you notice there are two objects segmented in BW2. Use bwareaopen to get a mask for the top texture. Use mask2 to extract the top and bottom texture from I. Outline the boundary between the two textures. Instead of entropyfilt, you can use stdfilt and rangefilt with other morphological functions to achieve similar segmentation results.